Our youngest son, Aidan, loves aliens. So for his birthday this year Jana and I decided that we'd take Aidan to Roswell, NM. Aidan was thrilled with this idea. 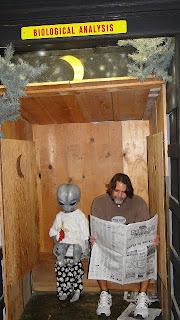 A friend of his at school had gone to Roswell during Spring Break and brought back pictures to show the class. 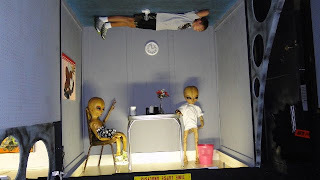 Ever since, Aidan has been wanting to go to Roswell and see the aliens for himself. 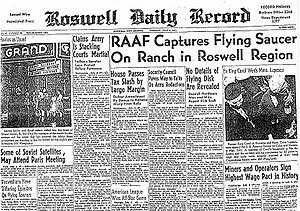 Facsimile copies of the July 8, 1947 Roswell Register can be purchased all over Roswell. The Register story eventually made its way onto the news wires and got reported around the country, in big city papers and on the radio. You can read more about the Roswell UFO Incident here. 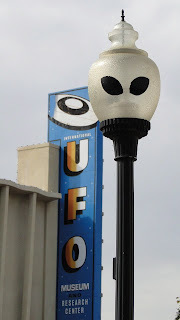 Today, downtown Roswell is a sleepy place with alien-themed streetlamps and couple of alien-themed stores to pull in the tourists and the visitors of the International UFO Museum and Research Library. 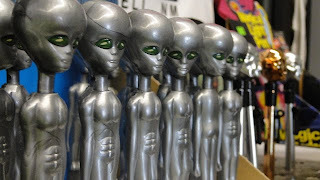 We went to Roswell with the intent to do every cheesy tourist thing you could do that involved UFOs and aliens. We also watched an interesting documentary about crop circles while at the museum. Very illuminating. All in all, a very fun visit and our birthday boy had a blast. But this isn't a blog about my family and personal life. This is a blog about psychology and religion. So what's the connection? Does invoking the name of JESUS CHRIST to stop an Abduction experience work for everyone that uses it? No it does not. It is not a magic word. For those who have accepted JESUS CHRIST as their LORD and Master and have made a personal relationship with him it does work. I think this highly important for my non-Christian readers to note. Please, if you are a non-Christian reader, don't think that invoking the name of Jesus will help you escape from an alien abduction. This only works for us Christians. Non-Christians will have to try something else. Best of luck with that. Obviously, as a psychologist, I'm just riveted by all this. 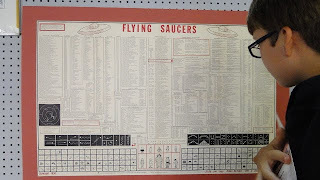 The whole UFO phenomenon and the culture surrounding it. Anthropologically speaking, it's just interesting to dip into these "cultures of belief" noting how they develop, evolve and deal with skepticism. The main feature is a kind of ideological insularity, gorging yourself on the information and voices that support the worldview. And it's not just with paranormal cults. Religious groups show similar tendencies, as do secular groups. Think about how FOX News or MSNBC thrive by feeding the true-believers exactly what they want to hear. It's a universal phenomenon. Which is why I think it so important to develop the trait of intellectual hospitality and curiosity. These are the epistemic virtues lacking in today's world, especially among many religious groups. I love it!!! Especially the picture in the outhouse. You need to have a contest for captions. 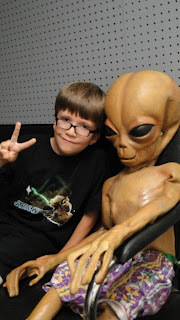 Your son looks to be about the same age I was when I was completely obsessed with Aliens. I don't think my parents knew how much I was, but I was checking out all the books I could at our school library on the subject and gave myself a few nightmares by reading the books a little too late at night. I think that would be an interesting series to go through, especially since there are some real polar opposites that are exposed in the media when it comes to the topic. What a great post. I really enjoyed it, especially the pictures. The toilet one was just too funny. Wow! Good to know. Next time I'm about to be abducted I'll invoke Abraham, Isaac and Jacob (oh and Sarah, Rebecca, Leah & Rachel just in case). ps: great idea my boys are obsessed with aliens and ninjas right now. we'll have to hit Roswell at some point. Great observations, and such fun! Will you be watching the remake of "V"?